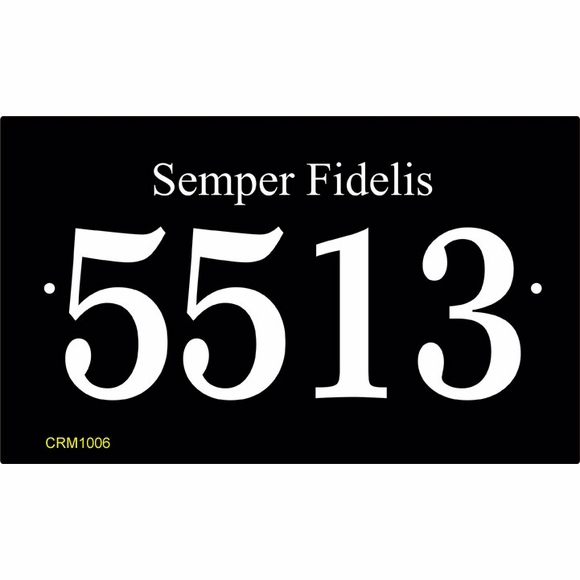 Rectangle Address Sign with Military Service Motto - - personalized with your house number and the Air Force, Air Force Special Operations Command, Army, Army Rangers, Army Special Forces / Green Berets, Civil Air Patrol, Coast Guard, Marine Corps, Navy, National Guard, or U.S. Military Academy / West Point motto you select. Made in USA. Wall mount or lawn mount. Lawn mount requires you to supply the lawn stake. We suggest purchasing the optional lawn stake designed for this sign. Click top link in Related Products. The motto you select will be printed in the font shown in the sample sign. The words in each motto are identified by italics in the following list and are the words you should type into the Motto selection input box. Air Force Special Operations Command: Any time, any place. Note: the style number that appears on the sample signs is for internal use only and is not on your custom sign. Made from sturdy and UV-stabilized laminated acrylic plastic with engraved personalization. Characters are permanently engraved into the sign during the production process. Eight vivid color combinations: sky blue with white characters; black with white characters; white with black characters; brushed gold with black characters; brushed stainless with black characters; kelley green with white characters; and yellow with black characters. Dimensions: 10"W x 6"H x 1/8". See Related Products for an oval version of this sign. Not big enough? Not small enough? Need more lines? Need more character spaces? Need vertical orientation? We will supply your address sign anyway you require. Please contact customer service with your specifications for a quotation (customerservice@comforthouse.com). Address Sign Lawn Stake 24"